The Central Ohio Bujinkan Dojo offers the techniques and concepts taught internationally by the Bujinkan dojo led by Dr. Masaaki Hatsumi. 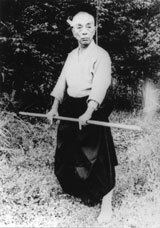 Often called "Ninjutsu", Soke Hatsumi refers to the skills learned through the Bujinkan as "Budo Taijutsu." The martial arts of the Bujinkan dojo are rooted in nine historical lineages. Centuries of trial and error, triumph and defeat provide a perspective that we use to develop and improve ourselves, our methods, and our strategies. Evolving beyond its roots of the samurai and ninja, Bujinkan budo taijutsu has become a combat effective martial system for the modern warrior. Through classes at COBD, you will develop basic skills of body movement: tumbling, falling, and leaping; delivering attacks with various parts of your body: fists, elbows, knees, feet, and head; receiving attacks: deflecting, evading, and avoiding; weaponry skills: knife, sword, staff, and rope; and strategic concepts: planning, maneuvering, and escaping. We study and practice traditional methods of unarmed combat strategies, a variety of traditional and modern weaponry applications as well as multiple attacker options, team defensive techniques and basic observation safety skills. With the goal of developing the whole human being, we apply these principals to modern self-defense situations and toward continuous overall self-improvement. The warrior mentality encompasses body, mind, and spirit. We welcome good hearted individuals committed to developing an indomitable spirit, awareness, and perseverance.